Ahead of Budget 2018, The Economic Survey of India 2018 was tabled in the Parliament on 29th January 2018 by Finance minister Arun Jaitley. The Economic Survey of India 2018 was tabled in the Parliament on 29th January 2018 by Finance minister Arun Jaitley. Economic Survey is a document which is presented in the Parliament prior to the Budget every year. The document outlines major economic indicators, flagship programs, happenings, challenges and policies of the previous 12 months; it also communicates future economic indicators and much more. 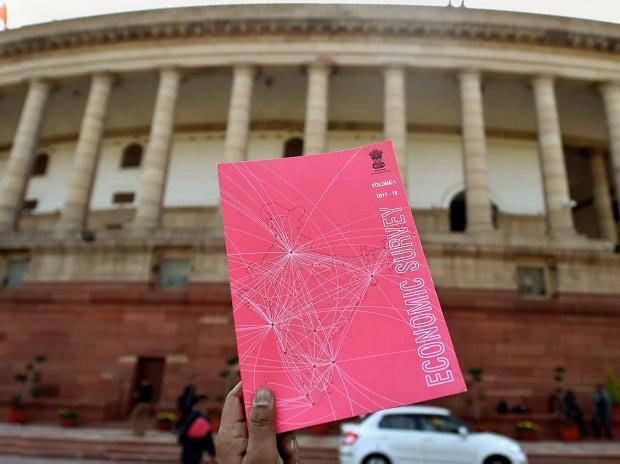 The Economic Survey of India 2018, prepared by Arvind Subramanian the Chief Economic Adviser to the Government of India had bright pink cover to send the message of empowerment of women and gender equality and put the emphasis on the fact that the government stands in solidarity with women’s rights and movements. The Survey also spoke about India’s obsession with male child. The Economic Survey of India 2018 touched upon numerous issues, expects believe that the focus of the Survey was on agriculture, job creation and women empowerment and the same is expected to be the theme of the Budget 2018. Top take away from the Economic Survey was that probably the worst is behind us and Indian economy is poised to take considerable steps in the near future. Mentioned below are the top highlights from the Economic Survey of India 2018. GDP Growth and Taxation - The Economic Survey 2018 has stated that the economy is poised to grow aggressively in the near future due to the major reforms undertaken in the last year. The document predicted that the GDP will grow at 6.75% in the current fiscal year and for the next fiscal year 2018-19 the GDP growth will be around 7-7.5%. The survey also noted that internal trade both in goods and services accounts for 60% of the Indian GDP. It also stated that there has been a sharp spike of about 50% in the number of indirect taxpayers and voluntary registrations by small and medium sized enterprises possibly to avail for input tax credit has also seen a healthy growth. GST and Demonetization - There is a chapter named ‘A New and Exciting Bird’s Eye View of the Indian Economy Through the GST’ in the Economic Survey 2018. The survey states that the implementation of GST and Demonetization together has increased the taxpayers' base considerably. The survey further noted that voluntary registrations from Uttar Pradesh, Tamil Nadu, Gujarat, and Maharashtra have seen a huge spike. Also 5 states namely Maharashtra, Gujarat, Karnataka, Tamil Nadu and Telangana together account for 70% of India’s export. The Survey also noted that demonetization has assisted people in improving personal financial savings. Inflation - The Economic Survey of India 2018 noted that in 2017-18 inflation has remained at moderate levels. The document also lists out the steps which the Government has taken to control inflation. The survey stated that the CPI (Consumer Price Index) is at 3.3% and WPI (Whole Price Index) is at 2.9%. The survey noted that the CPI (Consumer Price Index) is at its lowest in last six fiscal years and WPI (Whole Price Index) is also improving. Private Spending Set to Increase - The Economic Survey of India 2018 noted that the private investment will boom on accounts of reforms and resolution of NPA issue of the PSBs due to recapitalization. The reforms will improve the lending capacity and the spending capacity thus providing the impetus for increased private spending. The survey noted that other reforms such as Insolvency and Bankruptcy Code (IBC) and more will also help kick-start private spending. Rising Oil Prices a matter of Concern - The survey noted that rising oil prices is one of the major concerns for the economy. Growing oil prices may affect incomes and spending negatively and may also have an adverse impact on inflation. Higher oil prices will lead to tighter monetary policy which in turn will put pressure on interest rates. The Survey stated that if Saudi Arabia and Russia together undertake aggressive output cuts, oil prices may see further growth. Climate Change - The survey also outlines the risks of climate change and air pollution. It stated that India is committed to cut emission as per Paris Pledge to tackle climate change. The survey also mentions details about the role of 8 Global Technology Watch Groups and National Adaption Fund on Climate Change. Agriculture Sector - Economic Survey of India 2018 stated that as the migration of men from rural areas to urban areas is on the rise, more and more women are taking up agriculture. The Government has even declared 15th October as a Women Farmer’s Day. The survey also noted that weather changes due to climate change have had negative impact on agricultural yields. Other Sector specific information - Economic Survey of India 2018 also highlighted achievements in various sectors. It stated that India's Gems and Jewellery exports is one of the largest in the world, also it listed the fact that the government has also launched schemes to aid Gems and Jewellery, Leather and Textiles and apparels sectors. The Survey also stated various Government schemes and programs such as Pradhan Mantri Mudra Yojana for MSME sector; UDAN, FDI and airport development for aviation sector; Digital India for IT and Telecom sector and more. On power sector the Survey stated that the all-India power generation capacity installed has reached 3,30,860 MW and that electrification of 15,183 villages has been completed successfully.